For the first time, the byproducts of coal-fired power plants will now be subject to federal regulation. In a state like Missouri, which generates more than 80 percent of its electricity from coal, the new standards could have significant repercussions. But the rule, finalized on Friday by the U.S. Environmental Protection Agency, stopped short of classifying coal ash as hazardous waste. That means the federal government won’t be responsible for enforcing the new coal ash disposal restrictions. Instead, the EPA is leaving that up to states and citizen lawsuits. In a written statement, Andy Knott of the Missouri Sierra Club, said the lack of federal enforcement could leave public health at risk because Missouri is "a state where often the utility companies and state agencies that should be monitoring them enjoy a cozy relationship." The Missouri Department of Natural Resources, the agency charged with implementing the new federal standards, said it is currently reviewing the rule to determine its effect. During a conference call with reporters, EPA Administrator Gina McCarthy acknowledged that the waste produced from burning coal at power plants contains toxic elements like mercury, cadmium and arsenic. “When impoundments fail or coal ash dust is blown into surrounding communities, it contaminates the water we drink and the air that we breathe,” McCarthy said. But, she said, the EPA’s analysis of available data didn’t support regulating coal ash as hazardous waste. Regulating coal ash as hazardous waste under Subtitle C of the federal Resource Conservation and Recovery Act (RCRA) would have triggered strict federal permitting and disposal requirements, and allowed for federal enforcement. Even under the less stringent requirements of RCRA Subtitle D, all new coal ash ponds (wet storage) and landfills (dry storage) will need to be lined and monitored for groundwater contamination. McCarthy also said the location of new coal ash ponds and landfills will be restricted. “They cannot be built in sensitive areas, like wetlands, aquifers or earthquake zones,” McCarthy said. That could potentially have implications for Ameren’s plans to build a new coal ash landfill in the floodplain of the Missouri River, next to its power plant in Labadie. Washington University hydrologist Robert Criss has previously said that the planned landfill site is subject to flooding and earthquakes. 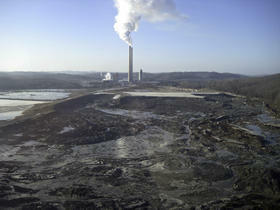 Ameren has decades of experience managing coal ash in a safe and environmentally responsible way. We agree with EPA’s basic assessment that reaffirms its longstanding position that coal ash is not a hazardous waste. Ameren is well-positioned to comply with the new rule. We have been actively working toward implementing industry-wide best practices related to coal ash management, including developing state-of-the-art dry landfills that experts agree are in the best interests of our customers and the environment. Ameren has recycled on average more than half of its coal combustion residuals into beneficial uses, and our ash recycling has routinely exceeded industry averages. The federal rule will also add new requirements to existing ash ponds, of which Ameren's four Missouri coal-fired power plants have about a dozen. Those will now need to be monitored for groundwater contamination, something environmental groups like the Sierra Club applaud. And according to EPA Administrator McCarthy, ponds that are "identified as polluting groundwater above health-based standards” will need to be lined or closed. The same will hold true for coal ash ponds that fail to meet engineering and structural standards, or are located too close to a drinking water source. You can find more information, including a fact sheet, FAQ, and the full text of the EPA's final coal ash rule, here.